There was great anticipation heading into yesterday’s midterm election of a sea change in young voter participation. Would this largest and most diverse US voting bloc finally make its due mark on an American election? If so, it would be a significant shift from their participation in the last midterm election in 2014. According to the US Census, while overall turnout that year was 42 percent, just 20 percent of eligible voters 18–29 years old voted. The University of California-Irvine precinct surpassed 2014 turnout totals with early votes alone, according to NextGen. As of noon Pacific Time, 2018 turnout was more than four times the turnout of 2014, the group reported. At Penn State University, NextGen was reporting one in four registered voters had cast ballots by around 6 pm ET. 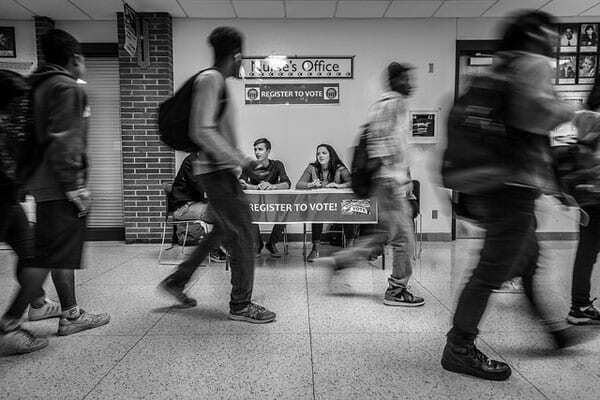 In 2014, fewer than 1 in 20 registered voters at Penn State actually voted. At the University of Florida, students cast more than 1,000 additional votes than they did in 2014, by around 6 pm Eastern Time. NextGen estimated a 20 percent turnout jump from 2014. In New Hampshire, 2018 vote totals have surpassed 2014 vote totals at most colleges and universities NextGen was tracking by 4 pm. CNN exit polls last night confirmed that young people voted overwhelmingly Democratic, with the very youngest voters, those 18-24 years old, at 68 percent.